The essential outback roadtrip: Alice Springs to the Devils Marbles – a drive through our country’s heart is one every Australian should make, says Georgia Rickard. There’s a passage in Tracks – that modern Australian classic about journeying to our nation’s physical and metaphysical interior – where author Robyn Davidson experiences a breakdown (breakthrough?) in mentality. She has been wandering in the desert for a month, human contact a gaping space in her mental frame, when she realises that she’s beginning to lose her grasp on the concept of self. “As I walked through the country, I was becoming involved with it in a most intense and yet not fully conscious way,” she writes. Later, she writes about the challenges this gives her, in reference to language. It was, she says, but the barest inkling of an experience. The crudest, most basic glimpse of a worldview built on 40,000 years of Aboriginal culture. Yet it was glimpse enough. That small experience reframed her life’s perspective, she says, from a separatist, ‘me-versus-the-world’ mentality to one focused entirely around existing as one with the land. Talk about a light bulb moment. Most of us will never make a journey like Davidson’s: not to our country’s interior and certainly not to our own. But to drive up the Stuart Highway, which barrels straight up the middle of the continent, is to journey into both. It is good, it is bad, it is not, in all parts, particularly pretty; but it is also impossible to leave without feeling glad to have been here. Our coastlines might be what convince visitors the world over to fall in love with another country, but it is here, in the heart of our outback, where Australians learn to wholly love their own. The road out of Alice Springs is long, flat and straight. Just two lanes, which slice through our middle in a line that heads almost true north. Impossibly, desperately vast, the landscape which surrounds it is one of sharp contrasts; the kind of brilliantly hard place that might bring out the best, or the worst, in a person. But there are shades of undeniable softness here: small but magnific hills of muddy green and blushing grey, wide cracked pans of ochre and brick, scrubby flats, hypnotic plains; and they smudge into each other by degrees as we drive the hot road, with the rhythm and fluidity of a love song. 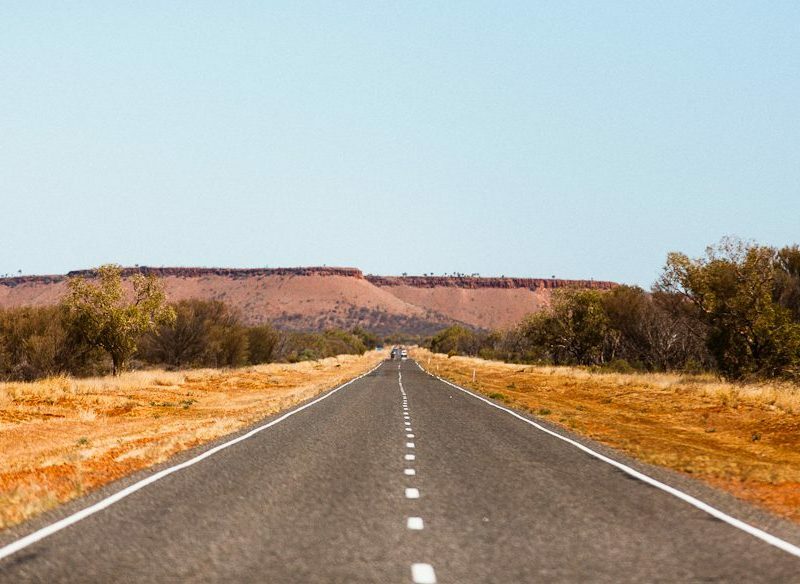 It takes only six hours to drive between the Alice and Tennant Creek, but there is so much more to this road than the drive. A place like this needs time. A handful of conspicuous tourism destinations sits along this stretch of highway – the so-called UFO capital, Wycliffe Well, the character-filled roadhouses and, of course, the Devils Marbles – but it is a homestead at Tennant Creek that is the surprising capturer of hearts. Owner Jerry Kelly, who is half-Warumungu, half-Irish, offers the typical tourist horse trail rides, but much more besides. Abandoned by his Irish father, he was brought up by his mother and the elders working on the station he lived at, and so learned to value the purposeful existence of station life as much as his traditional heritage (“there was no alcohol, and no trouble”). Now 54, Kelly runs extended rehabilitation courses for those facing alcohol and delinquency issues – but for anyone who is struggling, he says, not ‘just’ indigenous people. “There is no colour, there is no races anymore,” he says bluntly, sipping on a cup of strong tea. “We teach people to ride horses, clean the troughs out, workin’ with animals, workin’ with other people, we show them how to cut the boomerang, make bush tucker… The Aboriginal mob wanted me just to train the black kids,” he adds. You can’t help but admire such incredible values and colourblindness, and clearly many do – his business has been bestowed with several local awards. But doesn’t he want to help those from his culture specifically? Why the focus on teaching the ways of the white world? What about his culture, his indigenous heritage? Cockatoos scratch out their calls in the golden afternoon. The sound of wind chimes drifts through the breeze. But your culture, I repeat. What could be more important than culture? He doesn’t even hesitate. “Your job.” He stirs his tea. “Working is the answer,” he repeats. were taken in as a last resort; injured strays who would have otherwise been put down, animals abandoned by previous owners who gave up responsibility before Kelly accepted it. neither an apathetic surrender, nor a reaction born of anger and injustice but an acceptance of what is; a means of embracing the future. Type ‘Ali Curung’ into Google, and you’ll be warned about the area’s drinking and violence issues via a host of media reports. Twenty-two clicks to the east of the Stuart Highway between Barrow Creek and Wycliffe Well, a drive through this small dusty town – really, just a collection of a few, quiet streets housing 500-odd people – tells a tough story. But the flipside to this coin is a positive one. “You’ve gotta start somewhere to change the systems that don’t work,” asserts Ian Grieve, a white fella who, alongside wife Judy, has managed the art centre here since its inception, six years ago. We are standing in the middle of it, a solid timber shed stuffed with paintings of every colour, which stack and topple in piles and on walls in a riot of swirls and dots. Having relocated from Noosa with plans of staying just one year, the Grieves ended up recalculating when the flourishing art centre saw their initial role expand into one that not only fosters a local art industry, but offers training for the community, in topics as broad-reaching as budgeting, computing, retail, basic literacy and numeracy. Put simply, the art centre is now employing and training the community through its own success. Two artists, absorbed in painting with meditative hands, sit quietly amidst the morning busy-ness, as two dusty-looking road trippers, on their way from Arnhem Land’s Nhulunbuy to Alice Springs, chat to one of the assistants. Outside, a scruffy looking dog pads soundlessly by. Almost as if on cue, a local wanders in. Jangala ‘Joe’ Bird is a ninety-one-year-old elder of the Warlpiri mob, wearing bright skin and a grin as wide as his Akubra’s brim. He looks closer to seventy. “Now this is the kind of story that isn’t normally broadcast by media,” says Grieves, putting his arm around Joe, who looks back at him with good humour. Joe just stands there, smiling with his eyes. I ask what his secret to longevity is. “Work,” he replies. He is still smiling. Of course, the obvious highlight of this road trip is the Devils Marbles, or Karlu Karlu (loosely, ‘round boulders’). Each morning the sun rises afresh here, as though everything, including the air itself, has been filtered through a liquid purifier. Unlike the maturity and grandeur of so many natural Australian attractions – the drama of the Kimberley’s gorges, the quiet majesty of the Nullarbor – the land here feels young, and light, full of nothing but promise and life. It is easy to understand why many would fight over it. Which indeed they have. It was only in 2008 that the area’s Traditional Owners were granted title to Karlu Karlu as freehold land; even as late as the 1990s, there were talks of putting a railway line straight through the middle of this site (fortunately, though, those plans were successfully derailed). Today the area is a jointly managed conservation reserve, overseen by representatives of the Warumungu, Alyawarra, Kaytetye and Warlpiri peoples, as well as the Northern Territory Government. Despite this, the Marbles themselves remain a place of joy. To wander through here is to wander through the happenstance of an Alice in Wonderland narrative, where half-broken boulders lie, scattered, as if dropped from a careless child’s pocket as she skipped across the sky. It is all too easy to become disoriented here. Having entered in one direction and walked in a direct manner to the other side, you might expect to end up precisely where you planned, but that rarely happens. It is only upon exit that you’ll discover you have not walked to where you wanted to go, but have taken a circulatory deviation this way and that, meandering here and there, and have in fact been churned up and spat out sideways. It’s not a stretch to see why the women’s dreaming, Kwerrwympe, warns of eternal enchantment here. There are caves that exist underneath the Marbles here, and real people who live in them, who can entice you to follow them underground to stay with them forever. Or so the dreaming goes. Outside Ali Curung’s art centre, you’ll find a small, carefully tended vegie patch. Filled with native bush foods, it is sprouting slowly and surely under the hard light of the outback sun; a solid, honest contrast to the struggle of weedy strawberry plants and fungus-covered tomatoes of my inner-city yard. The garden was planted as a means of allowing “non-indigenous and indigenous people to engage in a way that is non-threatening,” says Grieves; a place where clumsy but well-intentioned questions might be asked, and forgiven. In a world where, elsewhere, that is sometimes still a challenge, it is a lovely thing to see. One can only imagine how tough it must have been for the expedition of explorer John McDouall Stuart, who slogged through this unfamiliar land in 1860 with no idea that the environment was in fact not barren, but filled with life when looked at with the right pair of eyes. Thanks be given that we’re finally seeing. “And it’s only taken us a couple of hundred years to get to this point,” enthuses Grieves, with the kind of passion that makes you want to give him a hug. He is right; cultural evolution is absolutely inevitable, though the answer to how that should be addressed – how the past should be preserved, and the future embraced – is as individual as each of us. Yet the value is arguably not in finding the answer. It is in asking the questions. If every Australian were to come here, and do that, we just might live in a different place. Fly to Alice Springs with Qantas. Tennant Creek is a six-hour drive north, straight up the Stuart Highway which stretches from Alice up through Katherine to Darwin. All major car rental companies service the airport. In Alice Springs, we stayed at the very comfortable (and very air-conditioned!!) Lasseters Hotel. In Tennant Creek, we stayed at the basic but surprisingly comfortable Bluestone Motor Inn, which also has a great little restaurant. In between the two towns, we would recommend the Wauchope Hotel, just 11 kilometres south of the Marbles. It’s a fantastic spot to base yourself, if you’re interested in seeing the Marbles at night (and don’t want to camp). 1. Slow down near Barrow Creek – you’ll want to get out and take pictures of the pretty ranges here. 2. Stop at Ali Curung and purchase some local indigenous art at ARLPWE Art and Culture Centre. 100 per cent of profits go back to the artists. 3. View the souvenir shop at the country’s UFO capital, Wycliffe Well. It’s cheesy, but you really can’t not! 4. Visit the Devils Marbles – ideally at sunrise or sunset when they are at their most memorable. 5. Take a trail ride, learn about local bush tucker and talk country with Jerry Kelly, at Kelly’s Ranch. 6. Visit the Battery Hill Mining Centre, a weird and wonderful little museum at Tennant Creek. We travelled around Australia in 2018. Undoubtedly, driving from Alice to Katherine was one of my highlights, especially Devils Marbles, a beautiful campsite with a crystal clear night sky and unique sense of remoteness. The following night at Banka Banka Station provided incredible insights into life fro families in Australia’s middle. My family loved it!